The winemaking process often ends in the glass. When Steve Clifton and Chrystal Seals of Palmina Wines first began their venture, they were motivated by experiences gained while living in Italy and determined to take a different approach. 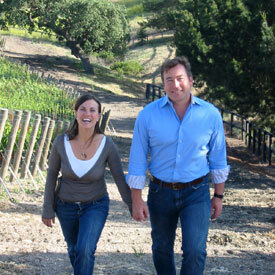 The couple follows a classic Italian style of winemaking: they create wines for the table, crafted to complement a meal. For the Cliftons, enjoying wine is all about discovering the perfect food and wine pairing. In our conversation with Chrystal Seals, she explained this approach is so important that the couple even creates new recipes for each new vintage. In doing so, they found one ingredient that goes with almost any kind of wine is extra virgin olive oil. They also learned that the right olive oil can make or break a pairing, so the couple wanted to offer an olive oil of their own to tasting room and online customers. Working with The Olive Oil Source, they created a custom blend that is bottled and labeled under their own brand identity. Without having to add another crop to manage, private label production became the perfect solution to their pairing problem. Why did you first get involved in the wine industry? We developed a real love for the lifestyle and the sense of community created from being with friends and family around a table eating and drinking. When did olive oil become a part of your life? We first started our “olive oil education” while living in Italy where olive oil is truly the lifeblood of the country. I was enchanted by the complexity and simplicity of freshly-pressed oil. I love the creaminess or bitter sharpness that different varieties of olive oil can offer. Like the perfect wine pairing, it can totally make a dish. Is tasting olive oil much like tasting wine? Absolutely! There are so many different varieties, textures, spiciness, creaminess, buttery smoothness. Olive oil is just as complex as wine. Learning about it is a life-long education, I feel like we are just scratching the surface. What's the most natural intersection between wine and olive oil? Our philosophy is to make wines for the table. We create recipes for each one of our wines as a way to promote our lifestyle philosophy. Wine is not just a beverage, it is an extension of the plate. Olive oil plays a huge part in that. We only cook with extra virgin olive oil in our recipes and in our house. It is not only a healthier choice, but a more balanced approach when working with our wines. In our tasting room, visitors can see our philosophy in action when they have a chance to sample wines and olive oil. Since we don’t have our own olive orchard, we worked hard to find local oil that would express that philosophy. It needed to represent the brand as if it were our own home-grown product. It was important to us to feature an olive oil grown from the same terroir as our wines. Italy - we love seeing friends and family in Fruili or Piemonte. We miss it when we are not there. Our wedding feast at La Subida, in Cormons, Italy. Such delicate flavors from prosciutto over frico to handmade pasta with a light cream and poppy seeds. The whole meal from start to finish was a dream come true. What is your favorite wine and olive oil pairing? Tocai Friulano with marinated asparagus and a poached quail egg topped with a floral olive oil. What is your most satisfying achievement? Building Palmina with Steve along with creating our beautiful family. What’s next on your horizon? Who knows? A winery-focused TV show? Food truck? Cooking classes? Travel food and yoga classes in the vineyard? We’ve got so many ideas just waiting to be explored!